I’ve been trying to expand my horizons a bit when it comes to athletic, wear, and this week I decided to try out the bralette version of the Jalie Julia Camisole and the Sinclair Penny Leggings. I made the Jalie Julia tank twice last summer, and while I love both of them, they aren’t very bra- friendly (tend to show the straps too much), so I decided to give the bralette view a try, wit the hopes of somehow merging the two to create a shelf bra/tank combo. (see my Julia cami post here). For my first Julia bralette, I cut the size “P”, which corresponded with my bust measurement. The fit is close, but not perfect- I had to shorten the straps considerably, and I feel like the darts are unnecessary on my small bust (the P is the smallest size that includes them, sizes O and smaller do not have a dart). I absolutely love the design though, and with the added support of clear elastic inside the fold over elastic straps, it’s supportive enough for me to run in long distances. For my next Julia (which is already cut and sewn, I just can’t share it yet! ), I sized down, and was even happier with the fit- this one is totally wearable, but eliminating the bust darts really made for a more compressive top, not to mention an easier sew! Once you have the FOE technique nailed, this comes together pretty quickly (check out the Sewalong in the Fabric Fairy group for how-to videos). I’m thinking of even making one for my daughter- she obviously doesn’t need the support, but it would be adorable as a little swim top for summer! For the leggings, I branched out from my tried-and-true Inspire pattern to try out the Sinclair Penny Leggings. A good sewing friend has been raving about Sinclair patterns for months, and I was eventually won over by the fact that they include petite sizing- so no need to make big length adjustments! I was curious about whether I would need my typical 1/4″ rise adjustment, but as it turns out, they fit perfectly- no need to size down, adjust rise or height! My favorite feature of these leggings is actually the waistband (I used the contour band option)- it’s even higher and more contoured than the Stride Waistband, and as I’ve lost a little weight recently, it fits me better. I did, unfortunately, really miss the gusset that the Inspires include- every high end pair of athletic leggings I’ve owned includes a gusset, and for good reason- it’s needed to reduce stress on those inner leg seams during movements that require a higher range of motion. Overall, I think the Penny’s are an excellent everyday fashion leggings pattern, and with a few adjustments (i.e. including a gusset) could make a great option for working out as well. I like the waistband so much that I’ll probably be mashing it onto other leggings patterns in the future, so I consider them a great purchase. The fabric for this set is Athletic Brushed Poly from The Styled Magnolia– available for retail (no long pre-orders, yay!). This ABP is slightly different from other ABP I’ve worked with- it’s brushed, but has a finishing layer of something that makes it smoother than other brushed athletics, which I really like, as it prevents pilling and should improve the durability of the fabric (I’ll let you know how it wears over time!). The colors are saturated and stunning- I feel like a spring garden walking around in these, and I’m loving it! All the notions, including the Fold Over Elastic and ring for the back of the bralette were sourced from the Fabric Fairy. The Styled Magnolia also offers athletics on two other bases- brand name supplex (from this post), and yoga fabric (stay tuned!). I’ll be writing up my thoughts on these three bases soon, as well as continuing to try out a few other leggings patterns in preparation for a full comparison- so make sure you’re subscribed so you don’t miss those posts! Note: This fabric was provided to me for free, in exchange for my honest review. All opinions are my own, and I purchased the patterns myself! What are you sewing for Spring? Do you tend to go for florals like I do when the weather warms up? I really like your whole outfit. Every time I click on a link for the styled magnolia, my kindles and my computer will not take me there. I get a security alert. 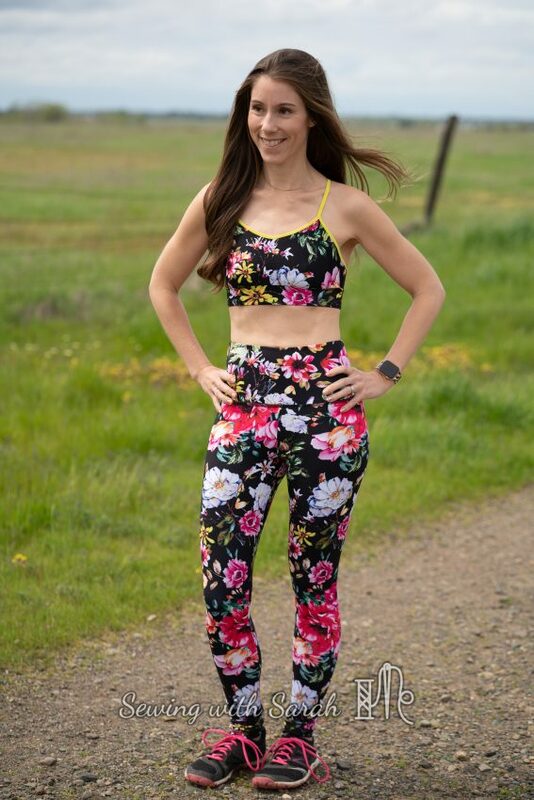 Have you tried the HeyJune Handmade leggings? The styled magnolia worked on my phone. What did the security alert say? My kindle says it fails something and my computer just says it is not secure. I just go back and search so sew English. 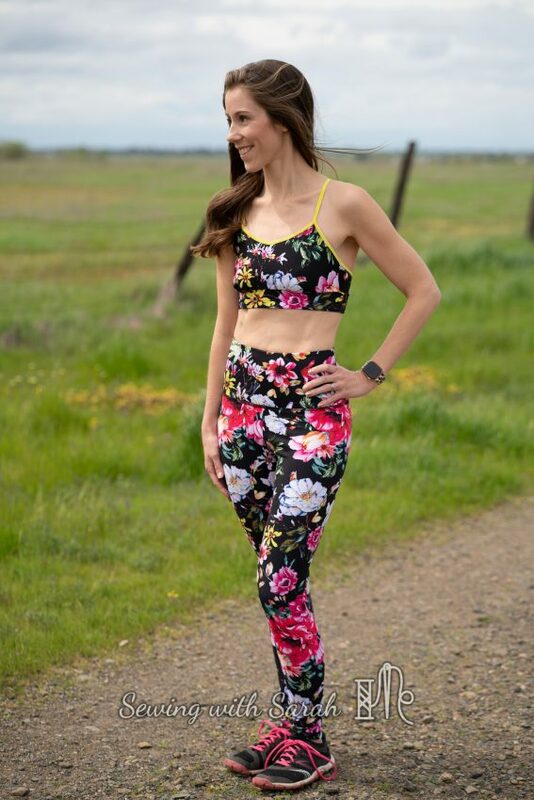 Totally beautiful athletic wear, love the floral print and the cut is really stylish. I noticed the waistband immediately, fits very well and looks like it would add security, coverage and comfort. Very impressive make and you look adorable in it! THank you Randi! I love the fit of this waistband, and really appreciate your kind words! oooh… I have this same fabric and just cut peg legs out of it. I can’t wait. I got 2 yards so can fit a pair of pegs and a Capri peg leg add on with pockets. These are beautiful on you! I really need to try out the Pegs- I feel like I’m the only one who hasn’t made them by now! Thank you! Love these! I just ordered a bunch of supplex from Styled Magnolia to outfit myself in fabulous workout wear on our next temp assignment to San Diego. I’ll be there for 6 months and I live in leggings down there. Such a change from cold Western Washington. Super cute inspiration! Oh, you’ll love san diego. I grew up there, and we visit at least twice a year!